Mushroom Bolognese Kale Lasagna is filled with layers of three cheeses, kale and a hearty mushroom Bolognese sauce, creating a rustic, earthy pasta dish perfect for a special occasion! This week the Sunday Supper Movement is joining Gallo Family Vineyards to celebrate an incredible milestone. Their Hearty Burgundy wine is celebrating its 50th birthday this year! Today we are sharing ways to pair, cook and entertain with Hearty Burgundy. For this celebration, I wanted to create something extra special. While the Hearty Burgundy pairs well with chili, Italian meat sauces and grilled sausages, I thought mushrooms would also pair beautifully with this flavorful wine. The inspiration for Mushroom Bolognese Kale Lasagna started with a mushroom Bolognese sauce. It is a chunky sauce made with dried porcini and baby bella mushrooms, carrots, red peppers, red wine and rounded out with mascarpone cheese. The sauce is wonderful simply served over pasta, but I wanted use it to create something fit for a special celebration. 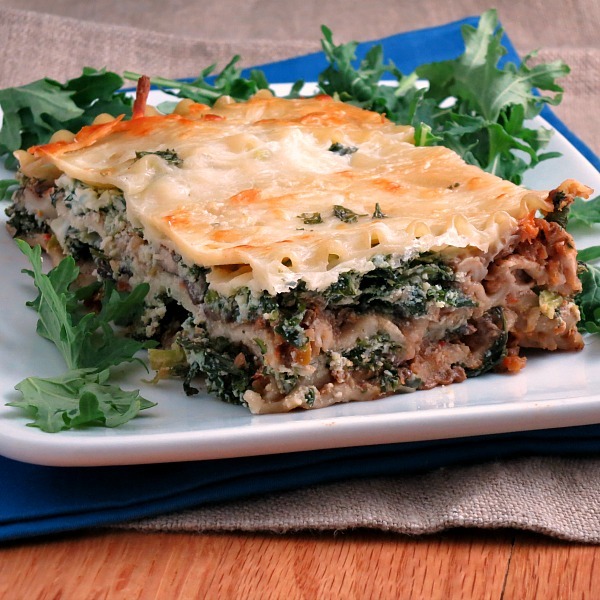 Something special, like Mushroom Bolognese Kale Lasagna! This lasagna is filled with layers of ricotta and Parmesan cheeses mixed with kale, mozzarella and the rustic, earthy mushroom Bolognese. A little extra work goes into making this dish, but it is a labor of love and a delightful way to celebrate the Hearty Burgundy. To commemorate the 50th Anniversary of the Hearty Burgundy, Gallo Family Vineyards is producing a limited edition Hearty Burgundy, which has a celebratory 50th anniversary label. The wine is blended to match as closely as possible to the original blend, with Zinfandel, Tempranillo, Syrah, Petite Verdot, Grenache and Cabernet Sauvignon all contributing to its full, delicious flavor. Thanks to Gallo, we received a bottle of Hearty Burgundy to enjoy. It is rich and smooth, with flavors ranging from dark berry to red plum, and is by far my favorite! Use the Store Locator to find where to buy the Hearty Burgundy near you and use the Food & Wine Pairing Tool to assist with pairings. First make SAUCE: In a small bowl, add dried mushrooms and then cover with hot water. Let sit for 10 minutes, or until mushrooms are softened. Strain mushrooms, reserving the soaking liquid for later use. Chop mushrooms. Put carrots, onion, red pepper and garlic in food processor and pulse until finely chopped. In a large skillet, heat olive oil over medium-high heat. Add vegetables, oregano, salt and pepper, and cook until tender (about 5 minutes). Next add porcinis, baby bellas, and stir in tomato paste, continue cooking until tomato paste is incorporated and the mushrooms are softened (about 5 minutes). Add the porcini mushroom liquid and red wine. Bring to a boil, reduce heat and let mixture simmer until liquid is reduced by half (about 10 minutes). Remove from heat and stir in mascarpone cheese until melted throughout. Next make FILLING: In a medium bowl, combine kale, ricotta cheese, eggs and Parmesan cheese. ASSEMBLE: Preheat oven to 350°F. Spray a 13x9-inch baking pan with cooking spray. Pour ½ cup sauce over the bottom of prepared baking pan. Layer cooked lasagna noodles to cover bottom of pan. Spread ½ filling over noodles. Sprinkle with ⅓ cheese. Cover with ⅓ sauce. Layer cooked lasagna noodles over sauce and repeat layering. Top with noodles, cover with remaining sauce and remaining mozzarella cheese. Sprinkle with parsley, if desired. BAKE: Cover lasagna with foil and bake for 45 to 50 minutes, or until cheese is bubbling. Then switch the oven to broil (or 500° if your pan isn't broil-safe), remove foil and continue cooking until the cheese is browned on top (about 5 to 10 minutes, but it can burn quickly, so keep an eye on it!) Remove from oven, let cool for 10 minutes, cut into pieces and serve! I’m going to start calling you the Lasagna Queen! From your beyond excellent cups to this. Wow! Honestly, as I was reading your post, I thought exactly the same thing…Lasagna Queen. This definitely would be worth the extra effort. Lovely! You have definitely won the title! What a gorgeous lasagna! And adding Hearty Burgundy definitely pushed the flavor over the top!!! This Mushroom Bolognese Kale Lasagna is beautiful and looks so delicious! I was going to do a Mushroom Bolognese . . I love a good hearty mushroom Bolognese sauce!! but my husband got his wish (and the beef + sausage) in my Bolognese sauce. . beautiful!!! OMG Alida this sounds so amazing, I wish I could have a plate of it right this second. Definitely pinning this for a special occasion! I could happily eat on that all week long! This recipe looks absolutely amazing. I love vegetable lasagna already and can only imagine how good it must be with the Hearty Burgundy Sauce. Beautiful! A very different way to serve lasagna. I love it, Alida! Wow, you lasagna looks amazing! I would love to have this for dinner! It’s healthy and what a great way to use burgundy wine! Oh wow! The sauce alone sounds wonderful but add it to layers of cheese and noodles? I know this would be a hit!